1. 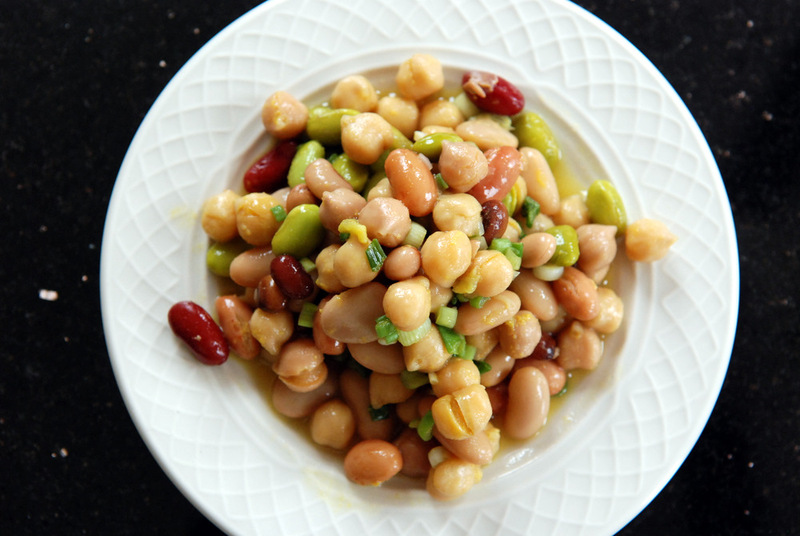 In a large bowl, mix together the chickpeas, mixed beans and edamame. 2. In a separate small bowl, combine the green onions, cider vinegar, agave nectar, lemon juice, mustard and salt and whisk until well combined. 3. 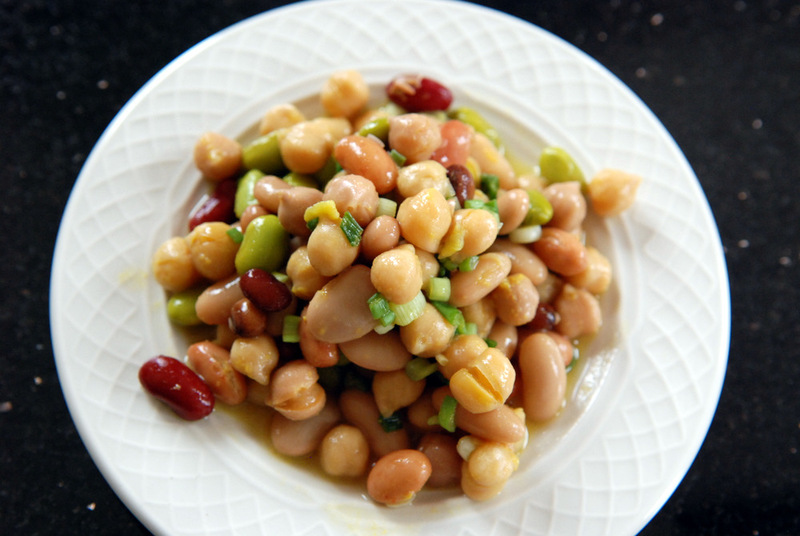 Combine dressing with beans and allow to marinate at least a few hours before serving. Keeps well (over a week) if refrigerated. Haha I love your super scientific explanations about tooting and beans. Thankfully, I’ve reached that threshold as well so I can eat beans with no musical problems! This is just the kind of salad that I crave…and one that I would definitely love to have on hand while traveling. You get tons of sustenance and nutrition, along with great flavor! Nutritious and fabulous looking salad.. I LOVE mixed bean salads. Especially to bring to Pot-Lucks. (And the fact that none of those folks are coming home with me means I don’t have to worry about the repercussions haha). What a beautiful and nutritious salad, I love bean salads and beans in general. Your dressing looks great too with a little bit of sweetness from the agave. Ohmygoshhhh…your pictures make my mouth water!!! That can is classic. I would buy some just to having sitting around for entertainment. 😉 I love my beans and have no problems with them. 😉 The salad looks like a great alternative to road food. Thanks for sharing it at Souper Sundays. We have so many variations of bean dishes like these. Most of them are tempered but yes what a lovely idea for a travel-dish! Lol love that you listed some “toot reducing tips”! 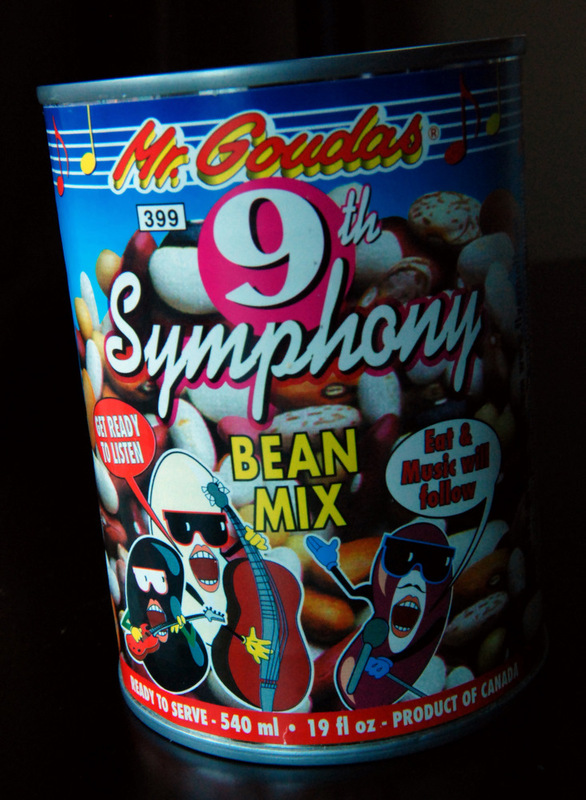 And the talking beans on the can are awesome. I’m really impressed that you made and packed this salad to bring with you on your trip! !